Shop at Sears Canada and receive a FREE 7 Piece Gift Set with any Estee Lauder purchase of $36.50 or more in Estee Lauder products from Sears Canada. This FREE 7 Piece Gift Set is valued at $82.00. If you spend $80 or more you will also receive a FREE 14 Day Supply of your Day and Night Moisturizers – Advanced Time Zone. Limited to one gift per customer, while quantities last. This offer is available until April 14th, 2014. 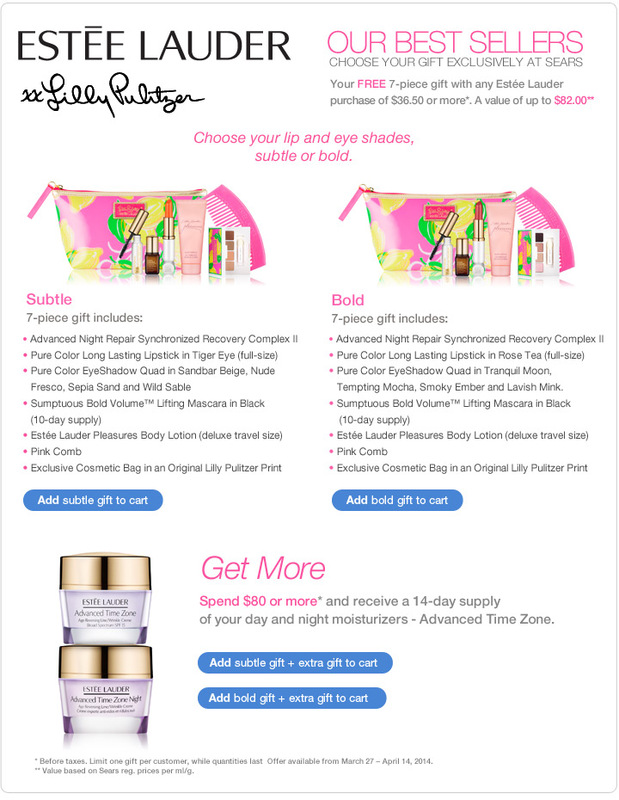 Click here to get your FREE 7 Piece Estee Lauder Gift Set from Sears Canada! Also, click here to get all Sears Canada online offers. WHY do they always give away the same lipsticks and eyeshadows year after year?????? Because they want you to give the free gift to friends & family to further promote their products.